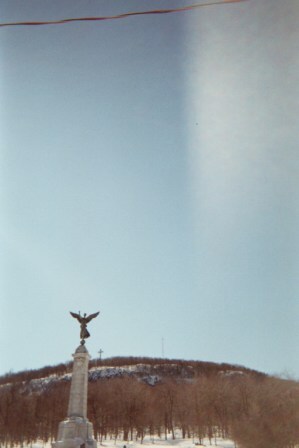 When I first got to Montréal I used to go up the mountain a lot. I had a Rocky Mountain Hammer model mountain bike that I’d owned for at least ten years. Unfortunately that bicycle was stolen near University Avenue one Saturday while I was working in Burnside Hall. Spindly locks don’t cut it around here. So, back when I had that bicycle, I’d ride up the main trail to the viewpoint, beside the big building my friend and I call “The Banff Building” because it looks like something you’d see in Banff. It is touristy but inside a wide open space awaits with paintings of Champlain and maps on the walls and squirrel statues on the beams. In winter we’d rest there after skiing to the top, mittens and coats beside the scorching radiators near a small area with tables and chairs. One of my very first trips up the mountain was in the fall near the beginning of the school year. I was still getting my bearings in what feels to me like a big city. Some grad students from places like Chicago and New York City kept telling me what a nice small city we live in, but I always thought that over a certain threshold it makes no difference. City is city is city. Now I have my bearings here and it doesn’t feel so big anymore. I rode up almost to the top that day, but just before the viewpoint I veered right and rode up a big steep hill. There I found a meadow with big trees, surrounded by bush, and not many people. There were a few trickling past, not too close, but close enough not to feel dangerously isolated. Dropping the bike down I enjoyed lunch of fresh bagels and cream cheese with hot tea from my thermos then some reading under the leaves. It was the closest thing to a hike in BC I’d had in a while. The amazing thing is it’s right in the middle of the city! I left wonderfully refreshed. Riding down I was a bit alarmed at mountain bikers who went full blast down the hill, weaving between people like they were pylons. Later I got a bell that I could chiching when coming up behind people. Since that day I’ve walked up the hill with friends, first dates, dogs, acquaintances and complete strangers. I’ve never had a bad experience up there. Very good explanation, thank you 🙂 Regards.